I first met C. Finley at SPRING/BREAK Art Show this year when Liz Collins introduced us saying “I think you two will get along” (or something to that nature). Finley was so open about her work at the fair and was excited to discuss her former mentee’s work (Zoe Schlacter), who Finley curated in a separate room. Her warmness was infectious and because of that I helped pique my interest in her. I recently had the pleasure to discuss with Finley, her queer mentoring, feminism, queer aesthetics, as well as upcoming projects. You were both an artist and a curator at the SPRING/BREAK Art Show this year, where you curated a room with artwork by Zoe Schlacter. What were some of the unexpected challenges in both presenting your work while also curating a separate room? SPRING/BREAK Art Show is a blast, it is exciting to be surrounded by so many creative people. Working with Zoe was a breeze, they are literally bursting with creativity, sincerity and kindness, so it was extra special to be a part of their first dip into the New York City art pool. The unexpected challenges were not being able to give Zoe's show all the time it deserved, I would have preferred to spend more time talking about Zoe's work. Zoe Schlacter's work at SPRING/BREAK Art Show, 2018. Courtesy of the artist. 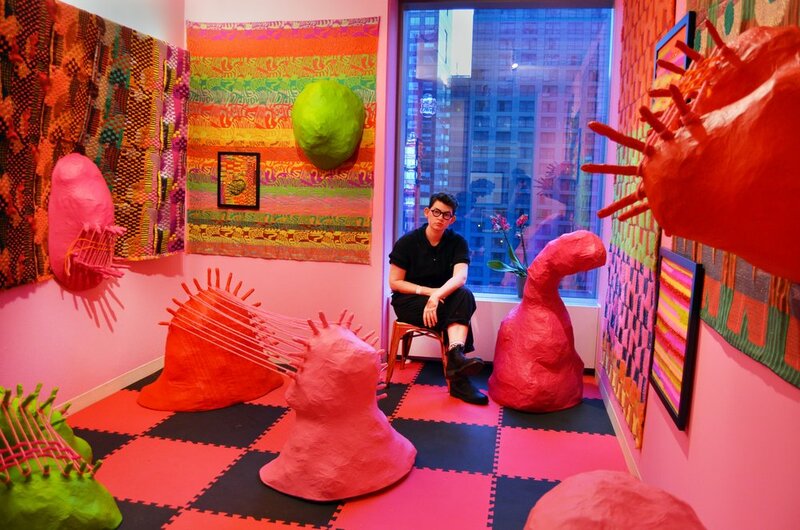 Zoe Schlacter was an artist you mentored through the program Queer|Art|Mentorship at the non-profit Queer|Art. What drew you to this program and want to become a mentor? Why was this important? Yes, Zoe and I are currently halfway through our QAM fellowship. Liz Collins put me in for QAM and I am grateful. When I saw Zoe’s application my heart skipped a beat, and I knew I wanted to work with this person. I feel this community fulfills a part of me that has been craving creative camaraderie. I am blown away by the people involved, it feels so good to be a part of a project in which people care for one another so beautifully. "When I saw Zoe’s application my heart skipped a beat, and I knew I wanted to work with this person. I feel this community fulfills a part of me that has been craving creative camaraderie." You are the founder and head curator behind the Whitney Houston Biennial, which happened in 2014 and 2017. This is obviously huge and immensely needed in the art world. Can you talk about this significance? The Whitney Houston Biennial gives opportunities to hundreds of female-identified artists. I wanted to create a platform to give other artists the things I felt I needed like studio visits, community, opportunities, press, and most importantly love and appreciation. I believe great art and a good sense of humor can change the world. "The Whitney Houston Biennial gives opportunities to hundreds of female-identified artists. I wanted to create a platform to give other artists the things I felt I needed like studio visits, community, opportunities, press, and most importantly love and appreciation." Your queer and female identity are a strong part of your art practice, how are you navigating in this current political climate, #MeToo, and inclusive feminism? My mission right now is to bring as much color and positive energy into this world as possible. Although times are tough, its time to inspire new dreams for the future. In my opinion, this starts with a spark of joy and creativity and moving forward from there. I find that this moment is my rally cry for large scale murals which celebrate life, the divine feminine, inspiration, creativity and joy. What other projects do you have on your agenda for the rest of 2018? I am very inspired right now, and I am painting up a storm in the studio. I have several murals in the works and have started working with an architect to begin some new sculptural public work. 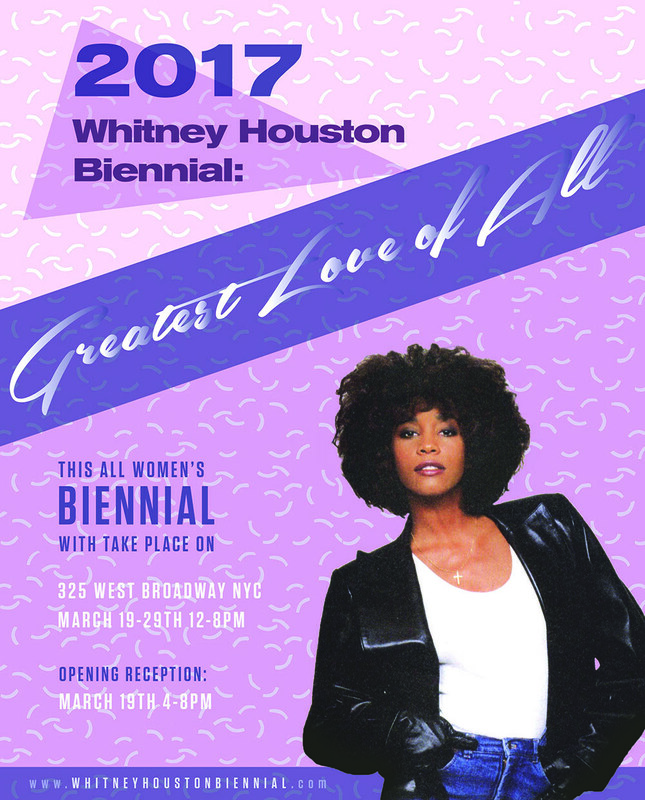 I will also be working on the Whitney Houston Biennial in preparation for March 2019! AQUARIUS Waterbearer (Full Bed) 74x54in acrylic on canvas, 2016. Courtesy of the artist. Skydance Mural, Houston, Texas. Photo by Morris Malakoff.